Gremlin-Centric Fan Art | Gremlins Online! A good friend of mine, Jammer started sending in a few gemlins drawings, and I am proud to have them exclusively here on Gremlins Online. If you have any comments for him, please sent them to me: Jypsy27@gmail.com and I will be sure he gets them. A stylized look at the gremlin that haunts your dreams. You know the one, its the one that makes you check all the closets and cupboards, turn on all the lights, and check under all the beds…. Here is the one and only Brain Gremlin, who looks almost as if he belongs in his own cartoon series…”Biology with Brain” it could educate and terrify children at the same time! Klobber is quite the video game fan, and you really haven’t lived until you have seen his Koopa Kids and Disgaea art! Xax is an original gremlin creation by Marsw that was her first mogwai, always trying to turn into a gremlin, which she prevented….until one day……Xax also loves Star Wars movies! What better way to spook your pregnant girlfriend than with a picture of your future child being “Watched Over” by a few (hopefully good-natured) Gremlins. Well, at least the kid will grow up to be one heck of a party animal! Brain Gremlin By Harley S.
This cute-yet-sophisticated rendition of the Brain Gremlin was sent in by one of our younger readers, Harley S.
Now if only all Gremlins were this cute! 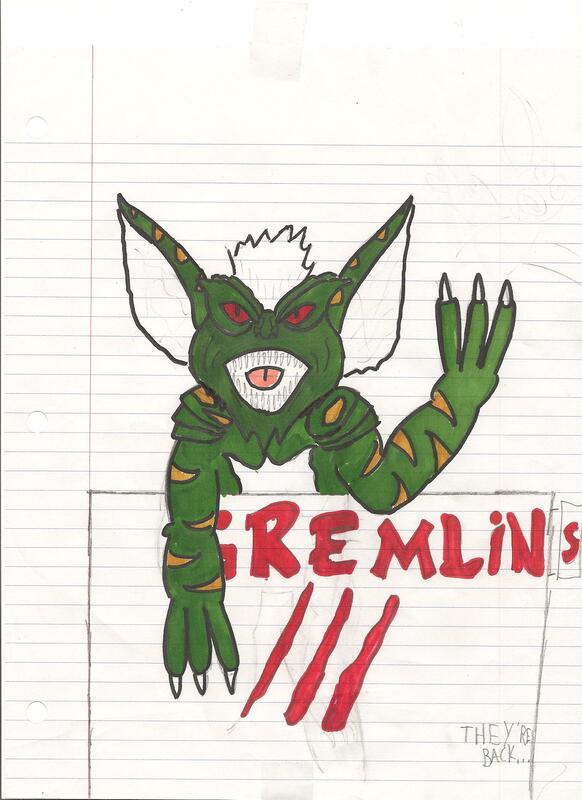 Sports Gremlin by Harley S.
Another great & adorable addition by one of our regular readers, Harley S! A really cool conceptualization of Mohawk, a bit more muscular and creepy. Check out silvermoonlight’s profile, she has some incredible predator stuff there, and has a knack for fanfiction as well! 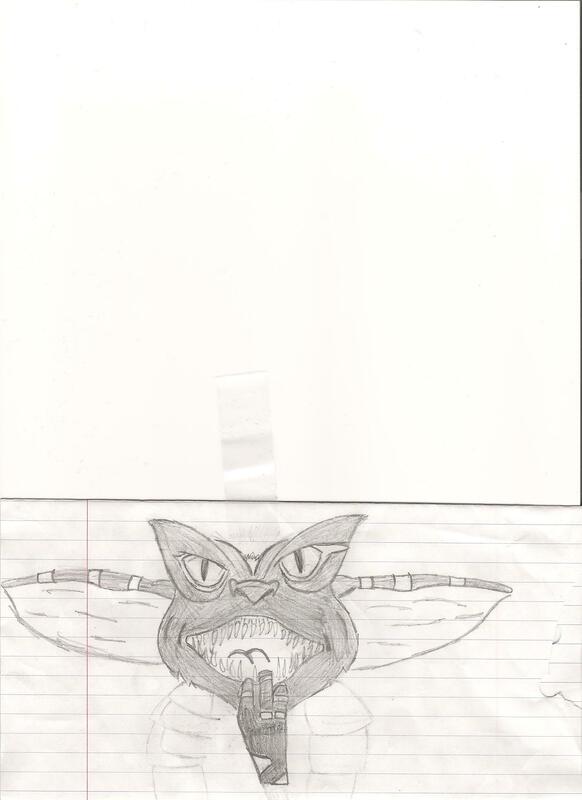 A great rendition of a Gremlin that just seems ready to jump out and claw you to shreds! 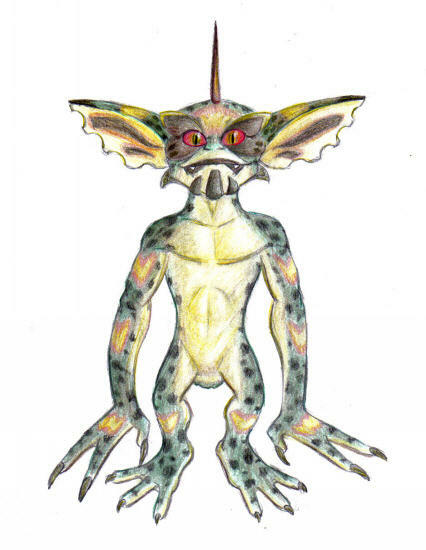 This Gremlin seems to be a bit closer to the original gremlins concieved in the early screenplays, that were not fun-loving beasties, but evil, terrifying little creatures. Ok, this one is pretty funny, but the malice that is in the Stripe’s eyes reminds me of the “He’s Coming For YOU!” card from the gremlins 2 trading card set, where it just makes you convinced that you are next! !